President Trump faces a crisis situation at home, with his cave-in over the shutdown that has led to government workers, 700,000 of them, facing day after day without pay. What better way to divert attention from the domestic crisis than a military intervention in Venezuela. Of course, there’s more to this than that, as the USA has always regarded Latin America as its backyard and regularly intervenes in the region- the military coup against Allende in Chile, the invasion of Grenada and Panama, the support for every murderous military dictatorship from Somoza in Nicaragua to the overthrow of Juan Bosch in the Dominican Republic to enthusiastic support for the bloody regime of Videla in Argentina, it’s all cut from the same cloth. To be clear, it is both Republicans and Democrats who have supported these policies, and they always have done. If Trump does intervene, expect no opposition from the majority of the Democrats. In addition, the entirety of the US mainstream media has been consistent in its support for the right wing opposition in Venezuela led by Juan Guaido. Guiaido’s Voluntad Popular (Popular Will) party has been funded to the tune of millions of dollars by US institutions like USAID and National Endowment For Democracy. The regime in Venezuela led by Nicolas Maduro bases itself on left populism and describes itself as Bolivarian, after Simon Bolivar, one of those instrumental in freeing Latin America from Spanish rule. It talks in the language of self-determination and nationalism and “Bolivarian socialism”, and thanks to its oil exports, has forged alliances with China, Russia and Cuba, and more recently, the Erdogan regime in Turkey. All of these powers will veto any moves to condone US military intervention in Venezuela and all of them to a lesser or greater extent support Maduro. The regime is very much anchored in the “progressive” military leadership as can be seen by a televised mass turnout of generals and admirals declaring support for Maduro. It supported Maduro’s predecessor, the late Hugo Chavez, and helped him to come to power. In actual fact behind the progressive rhetoric of both Chavez and Maduro lies a regime that protects private property and has inflicted harsh austerity measures on the Venezuelan masses. Private control of the economy actually increased under both Chavez and Maduro. Chavez developed a bourgeoisie based around the state, running a state capitalist economy, built on the earnings from oil. This newly developed state bourgeoisie consisting of military leaders, bankers, government ministers and speculators enriched itself with the oil revenues whilst small reforms were doled out to the Venezuelan masses. At the same time there was little industrial development. With the fall in oil prices, economic crisis hit Venezuela. Inflation soared by 80, 0000 per cent(!) and unemployment is set to rise above 44% by 2020. There are chronic food shortages. 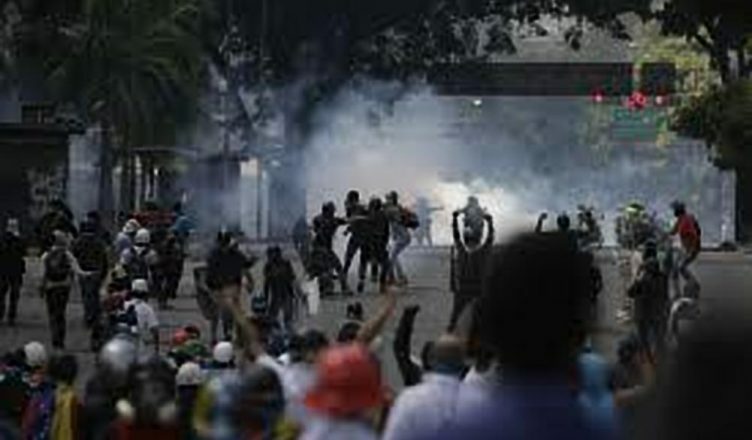 This brought forth protests around the country, protests that were answered with severe repression by the regime, which responded violently to strikes and demonstrations. Now the old bourgeoisie, organised around Guaido and his party, is attempting to overthrow the Maduro regime of the state bourgeoisie, with the backing of the USA. The Americans are eying up the rich resources of Venezuela, not just oil but other raw materials, diamonds, gold, natural gas, gold, bauxite, iron ore, and hydroelectric power. Trump’s henchmen, Mike Pompeo and John Bolton, have indicated US support for Guaido and look towards the overthrow of Maduro. Neither Maduro nor Guaido have an answer to the severe economic crisis hitting Venezuela. The masses there have to begin to organise against both these wings of the ruling class. This will be a difficult task but is the only real solution. In the meantime a mass movement against military intervention has to develop in the USA and around the world.